A weight management system from Max International that works with your active lifestyle. Switch supplement capsules enhance your metabolism and Curb Gluten Free high-fiber bars are a healthy snack. Flick the Switch today to start losing weight the healthy way with Meta-Switch weight loss system powered by RiboCeine for specialized glutathione support. 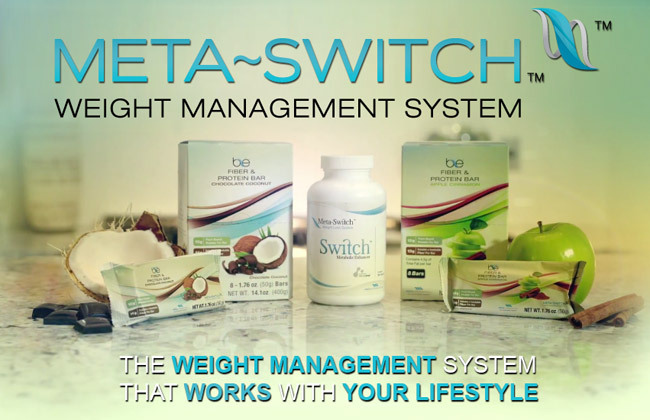 Incorporate the Meta-Switch Weight Management System as part of a healthier lifestyle today. Max International has developed an innovative weight management system that focuses on the healthy gradual reduction of body fat as opposed to simply focusing on a FAST reduction of the total number of pounds that a person weighs. The META-SWITCH system is successful because it was designed in accordance with scientific research on Glutathione and it does not involve starvation tactics or the use of stimulants. The foundation of success for the Meta-Switch Weight Management System is its focus on bolstering a person's metabolic power as opposed to will power. An independent study found that people who used the Meta-Switch System lost an average of 18.5 pounds over a period of 12 weeks, with fat accounting for 75% of the lost weight. The founders of Meta-Switch are committed to empowering people to help them look and feel their best every day. The tenets of the Meta-Switch system reflect Max International's desire to manufacture products that are part of a long-term strategy to improve health and wellness. Their focus on social responsibility ensures that they avoid any short-lived schemes that may only produce temporary results. The corporate culture of Max International includes participation in global philanthropic events and support of the Max International team and their corporate partners. Enjoy a Healthy Lifestyle with help from Switch supplement capsules and the Curb high-fiber snack bars. Developed as a result of groundbreaking scientific findings by Dr. Herbert Nagasawa, Meta-Switch capsules contain RiboCeine, a compound developed by Nagasawa to bolster glutathione production. The Switch supplement capsules and the Curb bars are used in conjunction with a healthful diet and exercise to curb food cravings while helping the body's metabolism operate at an optimal level. Because the Switch and Curb products are free of stimulants, customer testimonials often include statements praising these products for not producing a "jittery feeling". In addition to being free of stimulants and both products are deemed safe for professional athletes to use during competitions by the Banned Substance Control Group (BSCG). The Switch supplement capsules include a proprietary combination of nutrients and anti-oxidants designed to spur the body's metabolism to convert fat to energy. Key ingredients include RiboCeine, alpha lipoic acid, citrulline and leucine. Vitamins B and D are also included, as are potassium and pantothene. Alpha lipoic acid is instrumental in reducing oxidative stress while shielding cells from free radicals. RiboCeine plays a crucial role in the Meta-Switch system because it supplements glutathione production. Glutathione (GSH) is a molecule that is manufactured by the body to detoxify cells and protect them against harmful toxins and free radicals. As glutathione production decreases with age, Switch supplement capsules play a key role in bolstering an individual's overall health. Meta-Switch's Curb snack bars are used in conjunction with the Switch capsules to help reduce hunger cravings between meals. Created with a ratio of 12 grams of fiber to every 120 calories, Curb bars help create a feeling of fullness without harmful preservatives. Primary ingredients include corn bran, rolled oat, flax seed and sunflower seed. As the soluble fiber in Curb snack bars works to decrease hunger cravings, the insoluble fiber helps to funnel food through the digestive tract, thereby helping to prevent constipation. The ingredients in Curb snack bars also help to stabilize cholesterol and blood sugar levels, making them a welcome addition to health and wellness routines. By taking Switch capsules and Curb snack bars in conjunction with a healthful diet and exercise, long term weight loss may be achieved. Results of an independent study yielded an average weight loss of over 18 pounds after participating for 90 days in the Meta-Switch Weight Loss System. An average reduction in body fat of 4.4% was also reported, as was an average of 9.4 inches lost. The percentage of fat lost is critical, as proponents of the Meta-Switch system note that a pound of fat is the size of a softball while a pound of muscle is only the size of a golf ball. By concentrating on fat loss, the Meta-Switch system helps people reduce their overall size and fit into smaller clothes as opposed to only reducing the total number of pounds carried. The founders of the Meta-Switch system constantly strive to develop innovative ways to help clients track their progress with the system. For instance, the Max International team designed the Max Weight Loss App to help clients keep track of their progress with the Meta-Switch system. The app is available on iTunes and helps participants track their daily exercise and food intake. Through the use of this app, people can easily view the nutritional content of food that is consumed. Friends can be invited to join the program and people can comment on results posted by friends and other participants. The app also includes a variety of educational articles about weight loss and provides tools and challenges to help people stay motivated. Through the development of their Meta-Switch Weight Management System, Max International has offered the community a safe weight loss program that focuses specifically on fat reduction. Independent studies and client testimonials suggest that the system operates effectively without harmful stimulants and produces statistically significant weight loss results. The active ingredients in the Switch supplement capsules and Curb fiber bars combine to help curb hunger and promote cell health. When used with exercise as a part of a healthful lifestyle, the Meta-Switch System helps to empower people to make positive changes in the quality of their lives. People are more health and weight conscious now than they have ever been. Organic and diet foods have become more popular. Nutritionists have re-designed the food pyramid to make it easier to use and healthier to use. There are also a lot of meal replacements, weight loss supplements and calorie counting programs. If we are more knowledgeable of nutrition and exercising more, then why are we still gaining weight? America has a grave weight problem. It is estimated that nearly 70 percent of people in this country are obese or weight. In 1960s, the obesity rate was 10 percent. In 2010, the obesity was 35 percent. This means that the obesity rate has more than doubled since the 1960s. It is ironic that we are spending billions of dollars on exercise and weight loss but still have major weight problems. Fad diets require you to cut out certain foods and change your eating habits completely. These diets are very strict, so it is nearly impossible for one to follow it for a long period of time. Losing a lot of weight in a short amount of time can throw off your metabolism. It can take up to one year for your metabolism to return to normal. Meal Replacements Do Not Work Either Do you like the idea of only eating one type of meal for months or even years? Of course not, that is why it is very difficult to follow a meal replacement for a long period of time. Most dieters start skipping some of these meal replacements and eventually stop the program altogether. The weight returns after they stop the program. Raising your metabolism naturally and safely allows you to burn more calories. Reducing your appetite will allow you to get full off of less food. It is a lot easier to say no to unhealthy food choices when your metabolism decreases. These two things allow your body to use the available fats, protein and carbohydrates and start burning up the calories inside of the stored body fat. Max Meta-Switch has been designed to raise your metabolism and reduce your appetite. Continue reading to find out more about it. Boost your body's metabolism with Max Meta-Switch Metabolic Enhancer and Curb fiber supplement bars that promote healthy weight loss while reducing cravings for food and hunger pangs. Max International's Switch Metabolic Enhancer supplement is designed to engage adenosine-monophosphate-activated protein kinase, or AMPK. AMPK is known as the body's metabolic master switch. It helps regulate metabolism and glutathione levels. This helps you burn more fat, and it also helps control your eating habits. Switch naturally improves your metabolic system without raising your blood pressure or heart rate. Switch has Max's Riboceine technology, which helps boost the body's natural production of glutathione. Glutathione plays an extremely important role in the body. It helps protect against cellular damage, remove harmful toxins and support a healthy immune system. Glutathione is especially important if you are trying to lose weight. Both the inside and the outside of your body age as you get older. Our bodily systems and organs slow down and build up waste as we get older. Fiber is one of the key anti-aging supplements because it supports healthy digestion and cardiovascular functioning. Fiber is indeed a very important part of our life, but many of us are not getting the recommended amount of fiber. The Academy of Nutrition And Dietetics recommends that women get 25 grams of fiber per day, and men get 38 grams of fiber per day. However, it is very hard to get the recommended amounts of fiber without consuming a lot of unwanted calories and sugar. Fiber supplements have been on the market for years, but most of these supplements do not contain a balanced ratio of insoluble and soluble fiber. They only contain forms of soluble fiber. If you only get soluble fiber, then you will experience unpleasant digestive symptoms, such as bloating and gas. Why should anyone try a Switch Supplement Capsule? Switch turns fat into fuel through its core ingredient, Alpha Lipoic Acid (ALA), a powerful antioxidant that promotes a healthier metabolism. Adenosine-Monophosphate-activated protein kinase (AMPK) is a "master switch" that regulates cellular energy, metabolism and glutathione. AMPK can also improve insulin sensitivity. A healthy diet and an active fitness routine are ideal for increasing the outcome of the product, and the capsule works to support a person's recovery time while exercising, too. For everything from bicycling to weight lifting, weight loss can lead to fatigue and muscle loss. This can not only make a person feel less enthused about exercising but also may make them deter from working out altogether. These effects can either make a person's body weight plateau or pack on the pounds again. The Switch Supplement Capsule helps to stimulate skeletal muscle protein synthesis, which keeps a person's energy level up and eliminates the negative effects of exercising. Two capsules, taken three times daily for a total of six, normalize essential vitamins like Vitamin D2, thiamine and potassium, which are necessary to keep a person's energy levels up during the weight management process. As with the Curb Oat Cranberry Snack Bar, consuming the pills with water is highly recommended. If a Meta-Switch capsule or Curb snack bar is missed at a given time or day, treat the products the same way as exercise. Just go back to it the next day: same time, for best results. Now you have access to the ultimate weight loss solution. Max International introduces the medically designed breakthrough product Meta-Switch that is changing the way doctors and individuals see weight loss everywhere. Your body's metabolism can be switched back on with Switch™ Metabolic Enhancer from Max. Flick the switch that delivers healthy weight loss while reducing cravings for food and hunger pangs. This is achieved by activating the body's AMPK pathway through its propriety blend of RiboCeine, Alpha Lipoic Acid, Leucine. Meta-Switch Curb fiber supplement bars are gluten free. Lose weight then gain it back! Our experience of gaining weight as a society is weird because we have been taking better care of ourselves. We are more conscious of our health and weight than we were before, we have increased our intake of diet and organic foods, we have made changes to the classic "food pyramid" in order to incorporate a healthier dietary model to follow, we exercise more and we consume more weight loss supplements and meal replacement supplements. Despite the steps we have taken, seven out of 10 American adults are overweight and more than a third of all adults living in The United States of America are obese - this is an increase from a rate of 13 percent in the 1960's. The reasons why we are becoming fatter despite our efforts to be thinner are discussed below. We are obsessed with fad diets which require us to completely change our eating habits by telling us we can only eat certain foods. These diets are strict and too hard to maintain. Short term weight loss can unsettle our body’s metabolism for 1 full year. Having only one type of meal each day becomes boring; consequently, most dieters who do this start to forgo eating what is recommended for them and eventually regain the weight they initially lost. One way you can reach your goal of safely losing weight and inches in a sustained manner is to raise your metabolism without raising your heart rate, allowing your body to burn calories in a more efficient way. Another is to eat fewer calories. As you do this, you will lower your appetite and have an easier time resisting the foods that are too unhealthy. The combination of raising your metabolism without raising your heart rate and eating fewer calories makes it easier for your body to burn the calories it stores as it harnesses its supply of carbohydrates, fats and proteins. By taking the right diet supplements, you will have more success losing weight on a permanent basis. These supplements include Max Meta-Switch, SWITCH - The Metabolic Enhancer, CURB - The Natural Slimming Bar and The Meta-Switch APP Support System. Max International’s Switch Metabolic Enhancer supplement engages your metabolic system, helping you control your eating habits and more efficiently burn fuel and body fat without increasing your heart rate or blood pressure. CURB - The Natural Slimming Bar gives you the fiber you need to keep your digestive and cardiovascular systems healthy without causing you to absorb too much sugar or calories. Plus, it mostly consists of insoluble fiber in order to prevent you from bloating and having too much gas in your digestive system. This product gives you the proper balance of soluble and insoluble fiber; therefore, you enjoy more physical comfort as you avoid abusing your stomach and intestines. The Meta-Switch APP Support System Max Weight Loss App which has been picked up by iTunes and will be on the market shortly allows you to track the progress you make toward reaching your ideal weight. It has a lot of key features. They include monitoring the amount of food you eat; monitoring how much exercise you get daily; enabling you to invite your friends to lose weight with you; helping you find groups who share your goal of losing weight; monitoring your nutritional intake; and monitoring how much weight you and your friends are losing. You will feel better than ever by losing weight the right way as you take the supplements you have learned about. Max has released its latest nutritional science breakthrough in the form of a flexible weight loss, it's a revolutionary metabolic support system that cuts cravings and boosts you metabolism to efficiently burn off fat as fuel. This new way of successful weight loss does not require a strict exercise regimen, it does not restrict certain types of foods and it's not expensive! There are three elements to Max International's Scientific Breakthrough in Weight Management. Max Weight Loss System helps raise the body's metabolism to burn fat and reduce appetite to lose weight quickly. Your metabolism continues to work and you don't feel hungry or have cravings. There's no risk of increased heart rate or jitteriness because the Max Weight Loss System has no stimulants added BUT, it does have the power of RiboCeine working for you. Ideal for stopping unhealthy snacks between meals the Gluten Free Slimming Bar is all natural, dairy free, soy free, peanut free, and gluten free. This great tasting bar fills you up and best of all there are no artificial sweeteners or preservatives and it's low in calories Max helps your system in a natural way similar to the glutathione boosting products for long-term healthy weight loss. Max International have designed their weight loss products to work with any weight management system. To assist you in your weight loss journey Max have also created a detailed weight management plan with the assistance of a famous nutritionist and doctor. The Max Weight Loss Plan includes health facts, exercise tips, food recommendations and an exclusive weight loss computer and smartphone app. Furthermore, there will be a community approach that helps you keep you on track to reach your weight loss goals. Max International's Weight Loss System was developed in conjunction with a medical doctor that the editors of Prevention Magazine have called, "The world's leading expert on dietary supplements." It boosts your metabolism and lowers your appetite, to help you lose pounds and inches in a safe, heart healthy way. This isn't a strict regimen that dictates eating only certain types of foods or shackles you to expensive meal replacements or shakes that can rarely be sustained. Let's face it, most of us have a few unwanted pounds we'd like to shed a few wrinkles we wish we didn't have. And if you're like most, you've probably tried every fad diet and miracle cream out there. We all want to live the longest life possible, and hope that the aging process treats us well. Most of us dismiss it to being purely genetics, and figure if our grandparents didn't live past their sixties neither will we. Or, if we come from a predominantly overweight family, we simply dismiss our weight problems to being a genetic curse. Well, you can directly influence that depending on how healthy of a lifestyle that you choose to lead. All it takes is the desire to live healthy, and a little bit of dedication to eating well, exercising, and maintaining a healthy intake of the proper nutrients. As a Max International independent associate, you can have access to some of the best health food products to aid you in your journey. Not only can joining give you the products to succeed, but it can also help you pad your bank account. It offers you the ability to make your own pay check while you help others achieve a healthy lifestyle. There's nothing better than knowing that you will be financially secure no matter how hard the economy falls. Especially since you determine the amount of money you make the more effort you put into distributing the products the more you will earn. This means you have an unlimited earning potential when you join the company. Very few jobs can offer you that. Many people who have taken the leap and already joined have noticed a significant increase in their quality of life As their health improved, so did their livelihood. Some joined because they wanted to continue leading a healthy lifestyle, while others were stuck in a never-ending, medicine laden rut and found that it was their last hope to ditch the destructive cycle. There have been some instances where after trying out some of the Max products associates and preferred customers found that ailments modern medicine had failed to cure had suddenly vanished by their next doctor check ups. Sometimes it's the simple things in life that offer us the best results. You don't have to stress about losing weight when you follow the Max Metabolic Support Supplement, weight management plan since you know millions of others have succeeded with it before you. You're guaranteed to see fast results, which will make sticking to it that much easier. Make sure you remember to incorporate a healthy dose of physical activity with it, and you will be amazed at how well it really works. There's no reason to sit around feeling hopeless about the direction your health has gone when there is a dedicated team of professionals waiting to take you by the hand and guide you through the process of bettering your life. Nor is there any reason to watch your friends and family suffer with the same health problems that never seem to go away. With the help you receive, both health-wise and financially, you'll find that it's really is possible to reach your weight loss goals by implementing a few easy changes into your daily activities and following the right weight management plan. There's no shortage of scientific studies that show the benefits of maintaining a proper exercise regimen. Not only can moderately strenuous daily activity help improve your mood and over all well being, it can also help you fit into that pair of jeans that hasn't fit quite right since you put on a little bit of extra weight. As long as you take a few minutes out of your day for some physical activity, you won't always have to lie on the bed to get your pants zipped up! One of the best benefits you gain from regular exercise is that it has the potential to significantly improve your mood. If you find that you are constantly combatting depression, a simple at home cure lies in getting out there in exercising. You'll notice that you will feel happier, and your confidence in who you are and the way you look will increase. One of the tricks to being happy with who you are is to feel comfortable in your own skin and like the way you look. Regular exercise will not only help you lose the weight, but it will also help you gain more tone. This in turn will make you begin to love what you see in the mirror. Just remember that you don't want to set unrealistic expectations for yourself. Instead of expecting to fit into those size 6 jeans within the week, take it one step at a time and congratulate yourself with the small accomplishments. While aiming to only lose a few pounds a week may seem small, all those pounds eventually add up. Before you know it, you'll be ready to go shopping for a whole new wardrobe. If you're like many people, you're sitting down shaking your head right now saying to yourself that you just don't have time to exercise enough to lose any weight. Oh, but you can! There are many different ways you can incorporate a healthy dose of exercise into your daily activities, without having to sacrifice huge chunks of your day for squats and curling weights. All you have to do is take the time to walk up a flight of stairs as opposed to using the elevator, or park a little further out than you normally would when you go grocery shopping. These extra little bits of walking will quickly add up over the course of a day, and you'll begin to see that even the smallest amount of physical activity will help you burn calories. If you find that it's hard to keep up your exercise routine, consider adding in a little music. Listening to some of your favorite tunes while you are jogging or doing crunches can make the time go by so much faster. Or, perhaps bring a friend with you to work out. Sometimes, all it takes is a little encouragement to make it fun- especially if you like a little competition. What ever way works best for you; just remember to try to make exercising fun because you'll be that much more likely to stick with it! An even better way to keep exercising is imagining what you'll look like when you get done this can be an amazing motivator. When you finally reach your goal, you'll be proud that you were able to stick to it. Just remember that you have to keep up with some form of physical activity to keep the weight from creeping back. When you take the time to get a little exercise in, you can also reap the benefits of a better night's sleep. By getting some physical activity in during your day, you'll notice that you are able to fall asleep quicker- and stay asleep longer than you previously were able to. Although this may seem completely unrelated to losing weight, it can actually significantly improve your chances of dropping a few pant sizes. When your body doesn't get an adequate amount of sleep, you will wake up feeling tired. This will lead to an increase of stress. And unfortunately, when we experience a significant amount of stress we tend to eat more especially when we start having sugar cravings. By increasing the amount of sleep you get every night, and thus decreasing your stress levels, you will be able to knock out those stress-related cravings. Once you're able to all eliminate the calories you dump into your body when you are under constant stress, you'll start to notice the pounds dropping away. By joining Max 'A' Team as a independent associate of Max International products such as Gluten Free Slimming Bar, you have a proven key for weight loss success at your finger tips. When you combine the proven weight loss products from Max International, with your meals, you can give a much needed boost to your work outs. Not only will the cardio you are doing help you reach your goals, but so will the fat fighting properties of Max Weight Loss System. Many people have already experienced amazing results with the Metabolic Support Supplement and Max weight management plan. It's important to get all the vitamins and minerals your body needs while you are trying to lose weight. Eating a balanced diet is a good way to jump start your journey to healthy living. Aim to get all the recommended servings of vegetables, fruits, and meats in so that your body has the fuel to function properly. By eating well balanced meals every day, you'll see an improvement in your level of energy. Just be careful not to include too many saturated fats into your meal plan, otherwise you won't see any results when it comes to losing weight not to mention it's also bad for your cholesterol level. However, eating a good diet is a very good way to keep your body healthy and your immune system at its best. Eating a well balanced diet that is part of the Max Ultimate Food Plan is the perfect way to implement a proven weight management plan. By making sure you eat the right servings of your favorite fruits, veggies, meats, and cereals you will be able to keep your body functioning at its best. This means that instead of having to cure diseases after they have already manifested, you are giving your body the tools it needs to prevent them from even taking hold in the first place. A healthy life style is the best way to make sure you keep your weight down and the aging process in check. Pretty soon, you will notice that you won't even require all that medicine you previously thought you needed our bodies are perfectly capable of taking care of themselves. We just have to help them along by providing them with the right food choices. Max's Weight Loss System including the Gluten Free Curb Snack Bar can be a wonderful way to combine weight loss with eating right just drink some of it followed by at least 240mL of water right before you sit down to eat. It has already proven itself as an efficient abdominal fat blaster. And, as an added plus, you will notice an increase in your metabolism. By suppressing your appetite, it helps you not only eat less during meal time, but also aids you in keeping a positive mentality. If you find yourself struggling not to raid the fridge in between meals, Max Weight Management System is the ideal weight loss product for you to try It's already proven itself to countless others. The best part about the weight management plant is the guaranteed fast results. It's so much easier to stick with a plan when you can see that it's actually working- and in this case, working fast. One of the most important things to remember is that consistent healthy eating habits will lead to consistent results. By eating right, you don't have to get rid of all the foods you love. Just make sure that you are limiting the amount of saturated fats and sugars that you are taking in. You can still eat all the fruits and veggies that you love and still see results. However, try to avoid excessive snacking otherwise you're likely to sabotage your weight loss efforts. A healthy and delicious alternative to all those sugary snacks that pack on the pounds is Max Gluten Free Slimming Bar. Rather than grabbing a candy bar every time you feel your stomach start to rumble, try one of these instead. The best part about sticking with the Max Ultimate Food Plan is that you will be rewarded for your efforts which is something that we all like. As long as you make the effort to eat right, you will see results - guaranteed or your money back. Something that we all tend to neglect during our daily routines is all around us and has already shown that it aids in losing weight. It's important to ensure you are drinking enough water throughout the day. There are many different ways you'll benefit from increasing your water intake and weight loss happens to be one of them. If you're like most people, you probably don't drink enough to support healthy weight loss. And that's OK! However, consider what you're missing out on. By simply making sure that you get the minimum of eight glasses of water in every day you can actually start to make a dent in that unwanted paunch you've been carrying around all these years. An easy way to make sure that you are getting enough water to drink every day is to keep a water bottle on you at all times. So next time you go to reach for a soda because you're thirsty, grab that bottle instead and drink away the pounds. And, as an added benefit, a glass of water before meals can actually help suppress your appetite. This way, you won't eat nearly as much before you start feeling full. Who knew water could be such an easy way to cut back on calories? Eight glasses a day really isn't that much once you sit down and think about it. And if you are spreading it out through the day and say, grabbing a glass whenever you stop to take a break, before you realize it you will have already drank more than you needed to. Luckily, it doesn't matter what temperature the water is either when you drink it. Warm or cold, just make sure that you get it down so that you can start losing weight. There has been some speculation that drinking cold water can actually help burn a few calories as well- which is all the more reason to give the benefit of increasing your water intake a shot. It may end up being the key to seeing better results while being on a weight management plan. Don't forget to also include a good multi-vitamin supplement such as Max N-Fuze into your diet plan. When your body receives the nutrients it craves, you will notice a significant increase in your energy levels. With all that extra energy that you previously didn't have, it will be that much easier to keep up with a regular exercise regimen. And as long as you are eating right and exercising moderately, there no reason that you won't start seeing the pounds fall off. And, a good multi-vitamin has the potential to help your body function that much better when it comes down to your digestive tract, cardiovascular health, and memory retention. By joining Max 'A' Team as a distributor / independent associate of Max International products, you can aid others in their goals for not only weight loss, but also healthier living in general. By signing onto the Team, you can experience a unique opportunity to set your own flexible earning schedule. And who doesn't want to be their own boss? Because of its growing popularity, you can be sure that it's a sound investment. Instead of feeling the crunch that many other people are going through during the recession, you'll be able to give yourself the financial security of a company that's backed by millions of new supporters every week. What better way is there to lose weight quickly and make yourself a paycheck at the same time? By helping distribute the healthy products that Max International has to offer, you can be assured that you are helping millions with their goals every day. Each product is guaranteed to be effective, and is backed by a money-back guarantee. You'll feel good that you are helping someone else achieve their dreams especially since it means financial security for your own family at the same time. Aside from the Max International products that you've already read about, you will have the opportunity to work with a few more amazing products. All of these products can help with that ultimate goal of living a healthier lifestyle most of them provide the perfect way to increase energy levels while reducing your stress at the same time! All it takes to get started on shedding some of those unwanted pounds is a little motivation and the proper mind set. Coupled with the help of a few amazing products, and a proven weight management plan, not only can you achieve your own goals but you can also help others see theirs through as well. It really is possible to lose weight with Max International Metabolic Support Supplement if you stick with a good diet and regular exercise, and Max 'A' Team is here to help you. You're only a few steps away from Health, Wealth, and Happiness. Max International in Australia offers Meta-Switch supplement capsules and Curb gluten free high fiber snack bars as a healthy weight loss system that boosts your metabolism, reduce cravings for food and hunger pangs. Two amazing products, Switch Supplement Capsules plus BE protein rich fiber snack bars, work as the key element of an effective healthy diet together with an exercise routine. 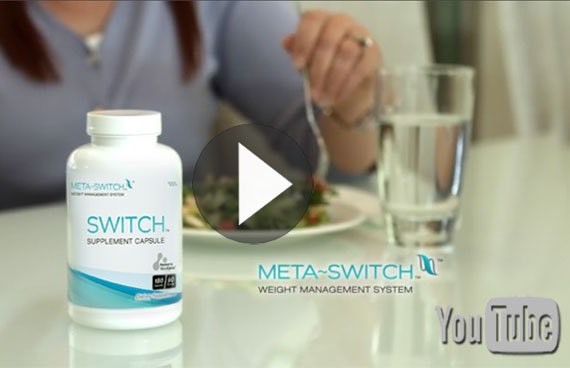 If you make Meta-Switch part of your daily routine you will greatly assist your chances of achieving your weight management goal, in a healthy manner without extra caffeine or other stimulants.